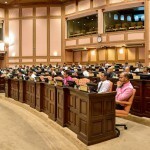 The opposition Maldivian Democratic Party (MDP) has submitted more than 300 amendments to the government’s flagship special economic zone (SEZ) legislation, currently in the final stage of the legislative process. Briefing the press on the proposed revisions (Dhivehi) yesterday, MDP MP Rozaina Adam appealed for the public and local councils to urge pro-government MPs to vote for the amendments. 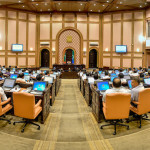 The ruling Progressive Party of Maldives (PPM) and coalition partner Maldives Development Alliance (MDA) have 48 seats in the 85-member People’s Majlis. The MDP contends that an SEZ law would pave the way for money laundering and other criminal enterprises, undermine the decentralisation system, and authorise a board formed by the president to “openly sell off the country” without parliamentary oversight. The party also objects to exempting investors from paying import duties or taxes for 10 years as well as allowing companies with foreign shareholders to purchase land without paying sales tax. 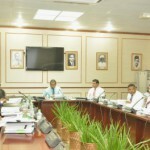 The government, however, maintains that SEZs with relaxed regulations and tax incentives were necessary both for foreign investors to choose the Maldives over other developing nations and to launch ‘mega projects,’ which President Abdulla Yameen has said would “transform” the economy through diversification and mitigate the reliance on the tourism industry. Following the submission of a report (Dhivehi) by the economic affairs committee after reviewing the legislation, the third and final reading of the bill began at today’s sitting of parliament. MDP MPs proceeded to propose and second the amendments, which would be put to a vote individually ahead of a final vote on passing the bill. MDP MP Ibrahim Shareef explained yesterday that the main changes proposed to the bill include removing a provision to allow companies with a 49 percent stake held by foreign shareholders to purchase land. The article would be changed to allow such companies to lease the land in lieu of ownership, he noted. Moreover, a provision allowing leasing of land to foreign companies for 99 years would be revised to reduce the lease period. The party further proposed adding a provision to require 75 percent of jobs in the SEZs to be reserved for Maldivians. In line with Article 41 of the Constitution, Shareef said an amendment was proposed to require “fair and adequate compensation” to be paid for private property acquired by the state. The MDP also proposed scrapping Article 74 of the draft legislation, which allows up to 40 percent of any zone to be tourist-related development with tax and duty exemptions. Moreover, Shareef said an amendment was proposed to prevent resorts under development from being declared an SEZ. Amendments were also forwarded for mandatory consultation with local councils ahead of declaring any region under council jurisdiction an SEZ. On provisions for offshore banking, Shareef noted that an amendment was proposed for the Maldives Monetary Authority or central bank to exercise oversight over the financial services. MDP MP Ibrahim Mohamed Didi – a retired brigadier general – meanwhile proposed an amendment banning any form of gambling or casinos in the SEZs. He also proposed outlawing the construction of churches or temples for the worship of other religions as well as any such congregation in the SEZs. Shareef contended that the party’s amendments would not obstruct the operation of the zones “fairly and without corruption in a way that would benefit the country”. MP Rozaina explained that the other amendments were intended to hold the government accountable through parliamentary oversight. An amendment was proposed requiring parliamentary approval for the president’s appointees to the investment board. Moreover, amendments were proposed to include either an opposition MP or one member from each political party represented in parliament on the investment board. Responding to opposition criticism of the SEZ bill last week upon returning from a visit to China, President Yameen noted that the constitution allows for “freeholds” and leasing of land for 99 years. Large foreign investments of US$300 to US$400 million would not be made if the lease period was any lower, Yameen argued, adding that “freehold rights” were offered for 99 years in developed nations. Referring to the ‘iHavan’ transhipment port project in Ihavandhippolhu, Yameen noted that the creation of SEZs would involve significant land reclamation while other areas that would be designated as SEZs were presently not utilised. “So if it is MDP or anyone else talking about it, we are going to go forward with this work. God willing, it will go forward. And God willing, the special economic zone bill will be passed,” he said. To be perfectly honest about this, no amount of legislative gymnastics is going to stop those who are hell bent on getting their grubby hands on $$$ that enter the country via the SEZs or any other means. Has any amount of legislation stopped corruption in the Maldives to-date under any government? Of course not. Of course, passing the SEZ bill also doesn't automatically mean that investors will be pouring in right away. This is the first step of a long process. The country will need to build trust with investors, show that the regulatory frame works and that a whole lot of other cogs work in unison. This is no mean feat; and it will take a good many years to get there. I understand why the government is keen to get this passed, since there are far more non-trivial and important tasks ahead. It's a bit like this: putting a bill board advertising "stuff" doesn't mean you'll get any buyers. There's a lot more work to do before the $$$ starts pouring in!